Breakfast Bend has some unexpected delights. Hidden way out in the sand, sometimes difficult to find, is a beautiful and healthy ecosystem. Large coral structures and colourful coral gardens are all full of life. Out in the blue are big schools of Barracuda and Batfish. 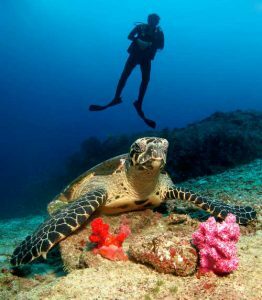 The shallower part of the dive site is a great place to dive with turtles. The reef is also the longest and most enjoyable drift diving experience in the Similan islands. The east side of island 9 was a popular place for Similan liveaboards to enjoy breakfast before their journey up North, hence the name. Some divers call the dive site ‘Three trees’ as this acts as a reference point to the most beautiful part of the site. Directly out from three distinctive white tree trunks you’ll find the best part of the dive site. A collection of granite boulders covered in beautiful soft corals. Three trees is stunning, but you need to judge the current if you want to find it. The reef at Breakfast Bend covers a large area. At the east point is a rocky outcropping that marks the southern border. Breakfast bend is nearly 1km in length with no clear border to the North. The reef is between 10m-20m. The coral in the shallows is not so healthy but there is still a huge amount of marine life. The most beautiful corals are not immediately apparent as they are hidden deeper out in the sand. A great dive site for beginners. It is usually quite an easy dive but it also has plenty to see. Breakfast Bend can be incorporated into the Open Water Course. To visit the deeper area of ‘Three Trees’ you will need to do the Advanced Open Water course. However, the reef is so long that there is a lot to find in the shallows. Turtles, moray eels and colourful reef fish like the rare Andaman fox face all live on Breakfast Bend. The Andaman Fox Face is a must see for marine specialists (see ‘Don’t miss’ below). But for more of a challenge swim to the ‘Three trees’ part of the dive site. You’ll need an experienced guide to find it. Contact us if you need more help. Pass the Trigger fish nests in the sand, a huge coral head full of cleaner shrimp, then a little further out to the granite boulders. Read the dive briefing below for a detailed explanation. The Andaman fox face (aka Magnificent Rabbitfish) is a must see. For people with a particular interest in marine life you will want to catch a glimpse of the ‘Siganus magnificus’ (pictured above). They are usually found swimming in pairs in the shallowest parts of the reef to the North. They are native to just a few spots in Myanmar and Thailand. They can be seen a bit more regularly in the Surin islands, but in the Similan islands this is the only dive site where they can be found regularly. As typical with many dive sites on the East of the Similan islands, Breakfast bend is a gradual sloping reef. The reef goes from 10m-20m and from there you can go deeper into the sand for a few extra surprises. Apart from the shallow and protected bays which are mostly used for diving courses, Breakfast Bend is one of the easiest and calmest dive sites in the Similan islands. Perfect conditions for inexperienced divers. For turtles and the Andaman fox face you need to stay shallow. For colourful wide angle shots you can go to the coral gardens at ‘Three trees’. The rare species of gobies found in the sand are a macro favourite. Do a current check! As a guest on a Similan liveaboard trip, this ‘top tip’ will not be your responsibility. However, it is probably the most important thing at this dive site. Breakfast bend is an easy dive, but only if you jump in the right place. If your jump is wrong then you will either have a difficult swim against the current or you will miss the dive site entirely. Breakfast bend has areas suitable for both beginner and more experienced divers. Beginner divers should stay close to the reef. It is shallow and very easy to navigate, as you simply need to pick a direction and swim. The briefing for the ‘Three trees’ section of the dive site is a little more complicated so we will focus on that area. Three white tree trunks line up next to each other on the North East of Similan island nine. The clearly visible white trunks are approximately the same height and are evenly spaced. On an island full of trees this sounds like quite a vague reference point. But, if you come to the Similan islands, you can see for yourself that they are quite recognisable. If the current is moving South to North, jump roughly 100m South of these trees on the edge of the reef. If the current moves in the other direction then jump 100m to the North. Once your group is all settled you can immediately start to swim to the edge of the reef and into the sand. If the visibility is good then it should be easy to find. If not then you can use a few markers. The first indication you are on the right track are the Triggerfish nests known as the ‘Trigger pits’. These nests look like craters in the sand with a diameter of one to two meters. The Yellow Margin Triggerfish that nest here are less territorial than the larger Titan Triggerfish. However, during their mating season, they will be protective of their eggs. It is generally good advice to give these nests a wide berth. This is particularly true if you see the brightly coloured orange eggs roughly the size of a golf ball. If you are close enough to see the eggs, then you are probably too close already. Swim away from the nest, staying close to the bottom, and they will leave you alone. South West from the Triggerfish you will find a coral head over 10m wide and full of macro life. One inhabitant here is the cleaner shrimp. If you find these colourful shrimp then swim a few meters away and wait for a minute or two. Coral groupers and other reef fish regularly stop at these small cleaning stations. You can watch as the cleaner shrimp jump onto the fish and maneuver around its body and inside its mouth to remove parasites and clean wounds. North East from this coral structure is where you will find the boulders and coral gardens. They are at a depth of between 22m-30m. The rocks are not so big compared to most Similan dive sites, but the coral that has grown on them is healthy and vibrant. It is good to spend some time exploring this area but leave yourself at least five or ten minutes of no decompression time, as it is a bit of a swim back to the reef. Use this route at slack tide or when the current is moving North to North West. Jump in near the Three Trees, or slightly further to the South if the current is strong. Head North East into the sand to look for the large coral head and Granite Boulders. Follow the boulders in a North West direction for about 100m until you reach the end. Here you will find a large barrel sponge. Turn South West and head back to the shallow reef. Finish the dive looking for turtles. There can sometimes be fairly strong currents around the Similan islands. There are two different types of diving in current which you can read more about here. The more fun of the two is definitely drift diving and this is what you will find at Breakfast bend. Similan island nine is not a small island, but if the current is strong, you can see one side of it in just one dive! As there is more flexibility with timing, the best way to dive Breakfast bend is from a Similan Liveaboard. Breakfast bend is one of the best drift dives as it is one of the longest. Anita’s reef and West of Eden can also make for some brilliant drift dives. Just make sure you check the current and jump in at the right location. Then you can let the current do all the work for you. Just relax and watch the reef pass by beneath you. Similan island nine is a long island, but in a good drift you can see half of it in just one dive! Christmas tree worms are one of the many small things you might miss if you drift past too quickly. The key to a successful drift dive is in the planning. 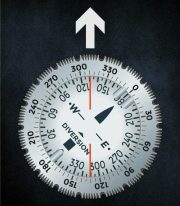 A quick current check is all that is needed for a divemaster to know the best spot to jump in. When you are in the water it is important to maintain contact with your buddy so you can have a nice controlled descent and stay together. Pay attention to the divemaster and stay with the rest of the group. Once you are on the reef you have three options. Option one is to swim against the current to slow your drift down. This gives you more time to see the small things like the hundreds of Christmas tree worms buried in the corals. The second option is to maintain your buoyancy, not swim at all, and watch the reef drift past you. This option is the most fun. Lastly, you can swim with the current and keep one arm extended out in front of you whilst loudly humming the Superman theme. We suggest you keep the latter option to a minimum as you will quickly end up in the open ocean. There are several dive sites in the world with much stronger currents and this is where equipment like reef hooks can come in useful. We do not use them here. The Similan Islands is a national park and is protected. With the strain of coral bleaching events, rising sea temperatures and increased carbon dioxide levels in the oceans, coral reefs are already under enough stress. Please make a very conscious effort not to touch any of the marine life, no matter what the conditions are like. The best time to do a drift dive is in the middle of high tide and low tide. This is where tide charts can come in useful. At high tide and low tide there is much less water movement and this is known as ‘slack tide’. But when the tides are falling or rising there is much more movement. At this dive site, if the current is going North, you should jump about 100 meters South of the three trees. If the current is going south, then jump to the north. If you judge it right you can have an amazing drift dive over some of the most beautiful corals in the Similan islands.